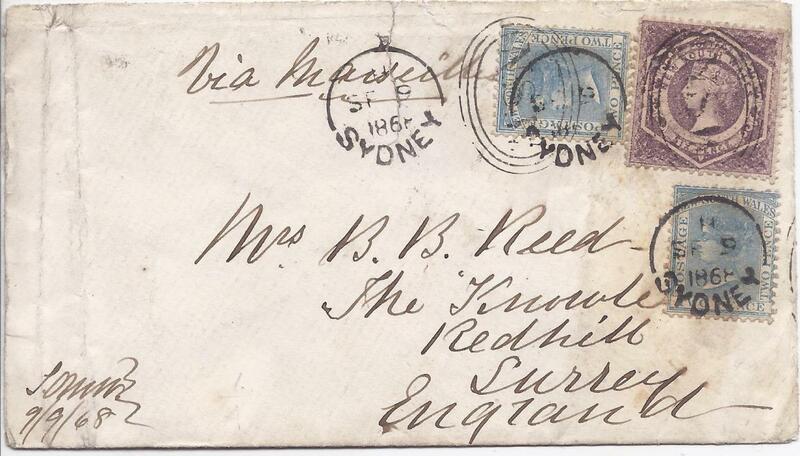 (New South Wales) 1868 cover to England franked 2d. 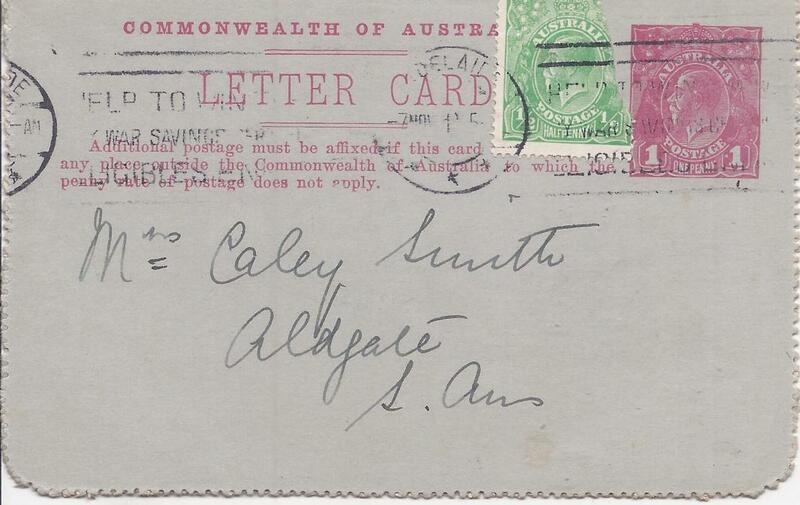 (2) and 6d., the tqo stamps at top cancelled by oval framed NSW handstamps and the 2d. 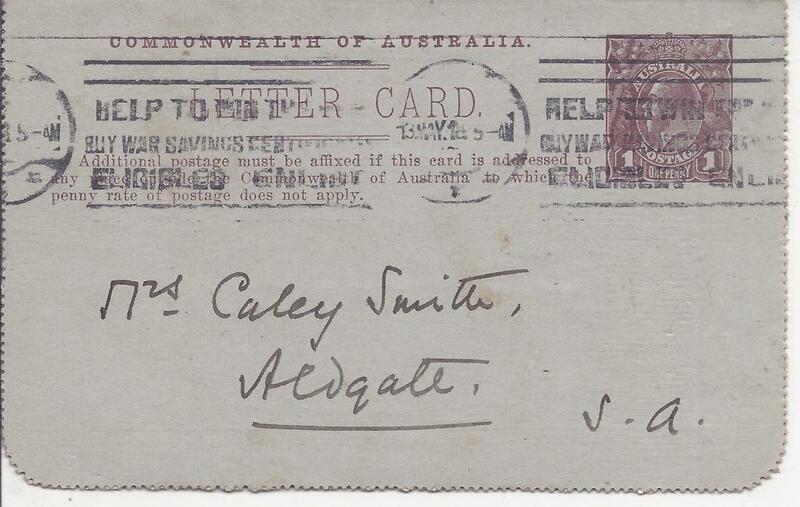 stamps additionally by Sydney cds, Redhill arrival backstamp. 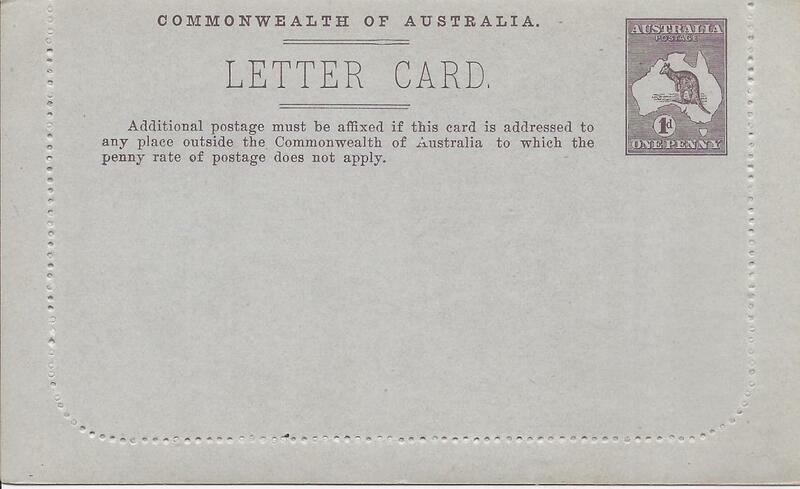 Some slight faults to the envelope. 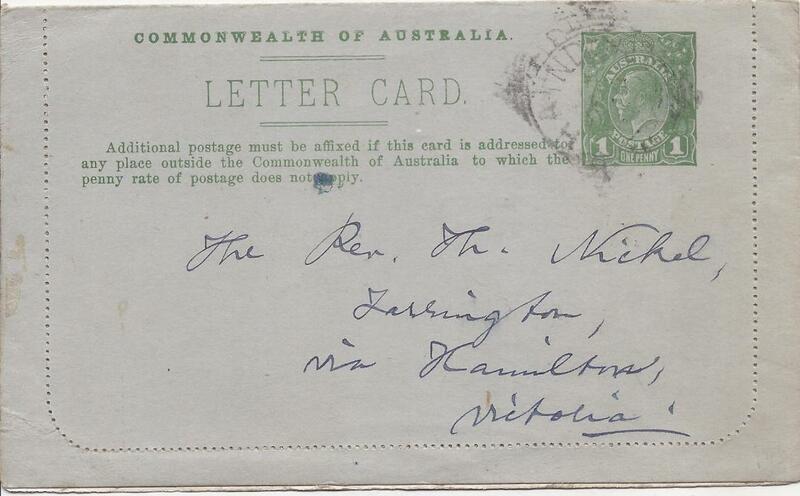 (Picture Stationery) 1910s 1d blue-green �fullface�, Setting II, text B, letter card, �Lorne, Victoria�, fine used with full message. 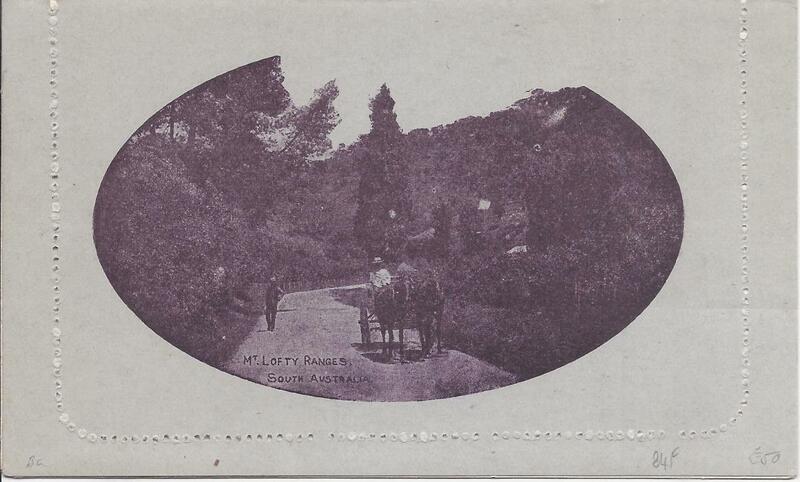 (Picture Stationery) 1910s 1d. 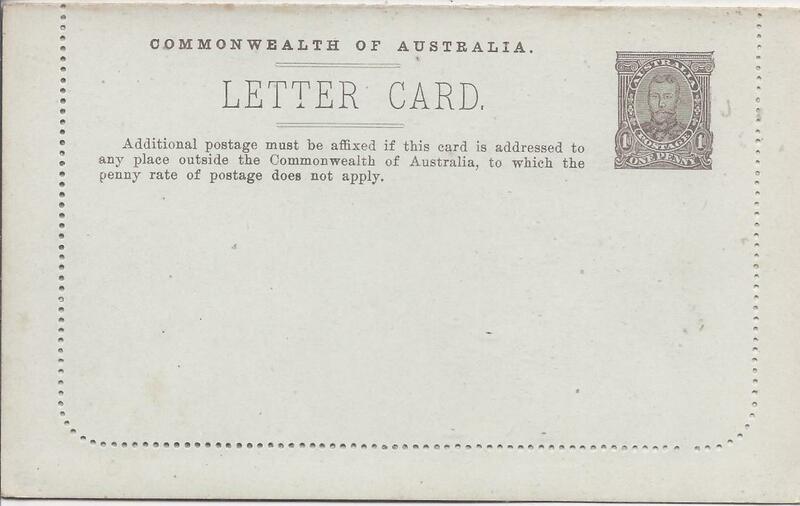 grey-brown �fullface�, Setting II, text A, letter card, �Pineaplles�, fine unused. 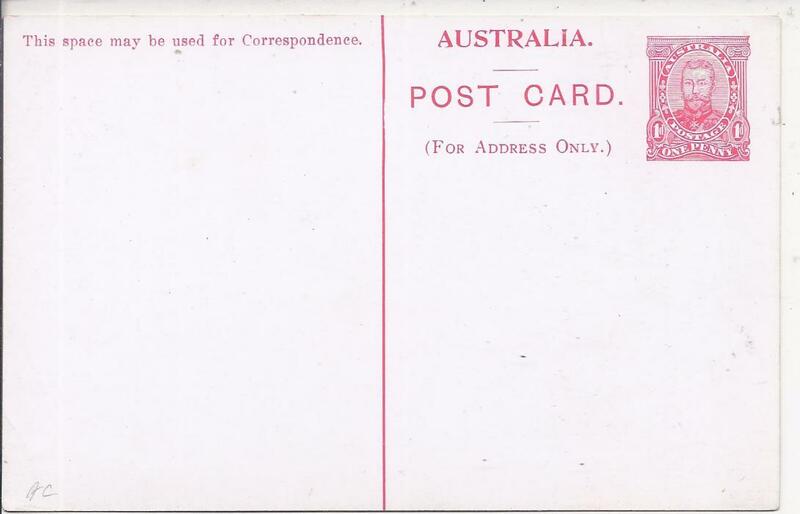 (Picture Stationery) 1911 1d card card in red with image �Coimadai/ Bacchus Marsh/ Victoria�, setting 1 with 5mm spacing, fine unused. 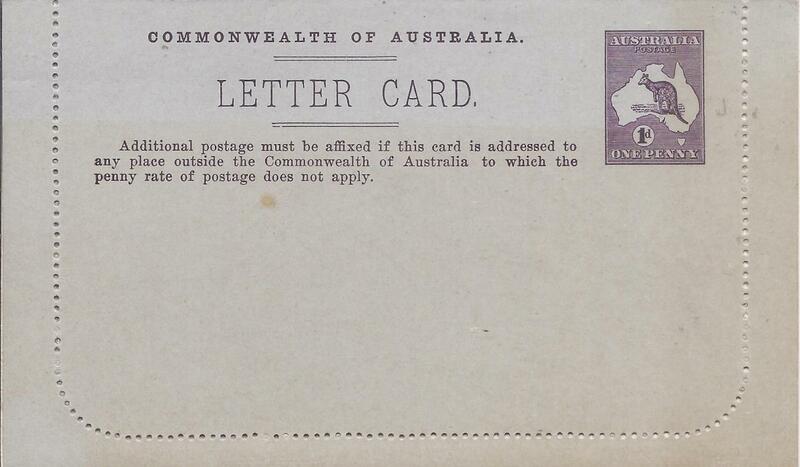 An unlisted colour. 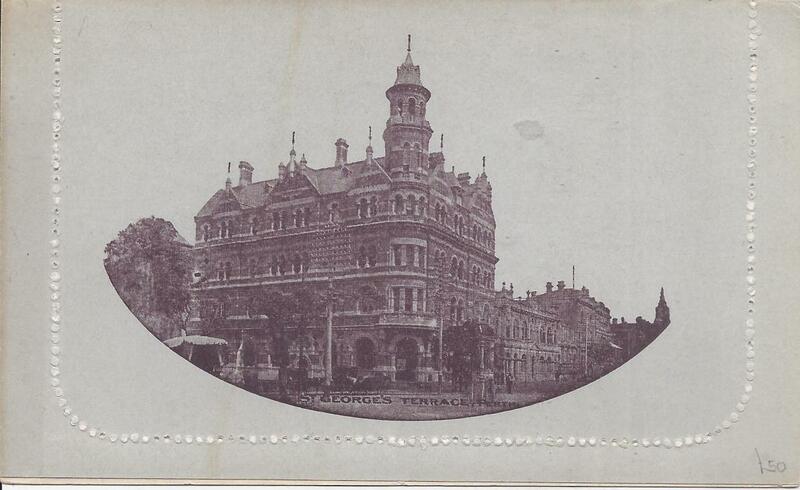 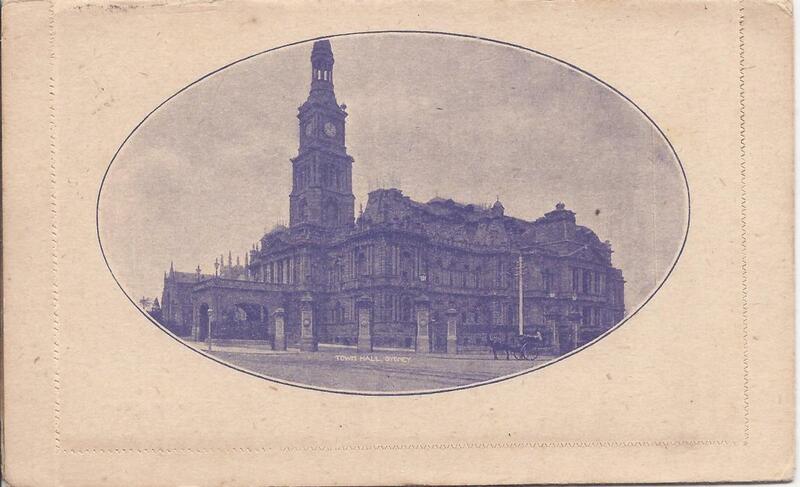 (Picture Stationery) 1911 1d reply letter card in a purple shade, the front image of Town Hall, Sydney and the return Phantom Waterfalls Victoria, fresh unused. 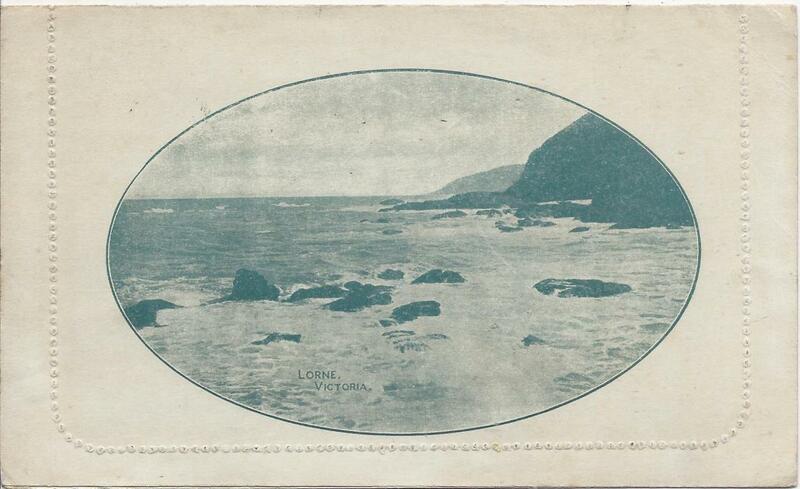 (Picture Stationery) 1913 Die I 1d. 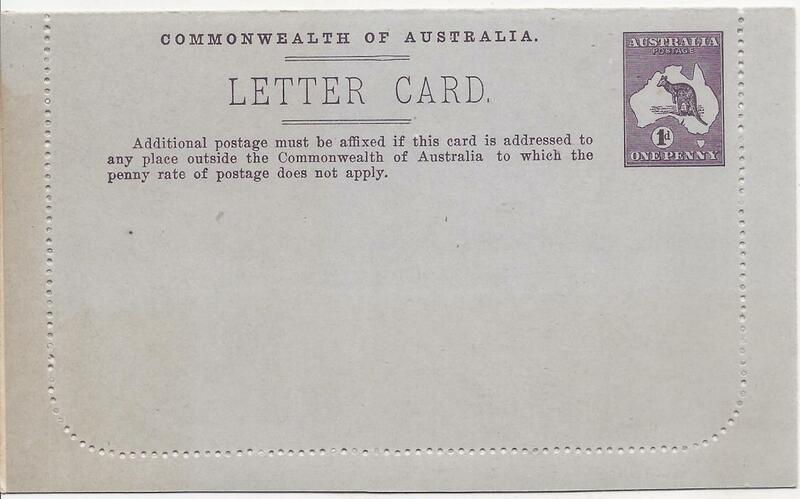 purple brown letter card, �Mt Lofty Ranges/ South Australia� fine unused. 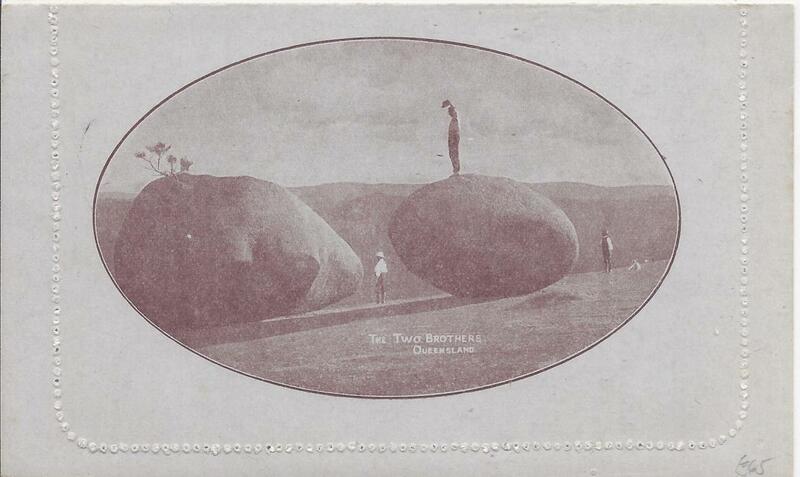 (Picture Stationery) 1913 Die II 1d. 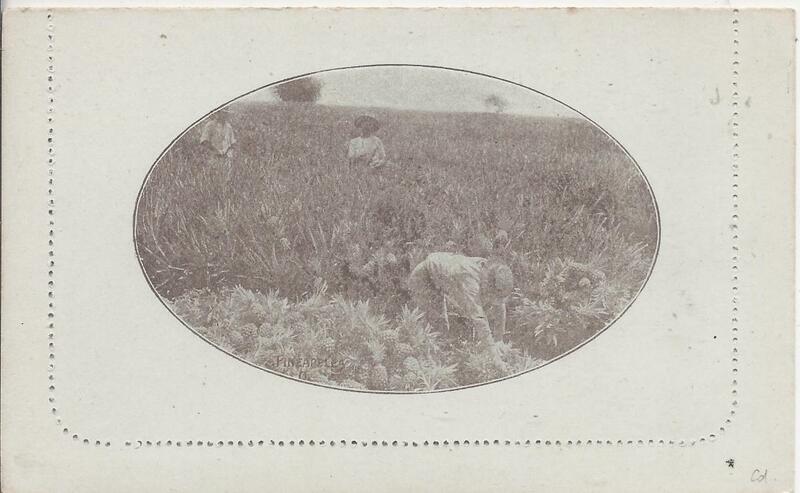 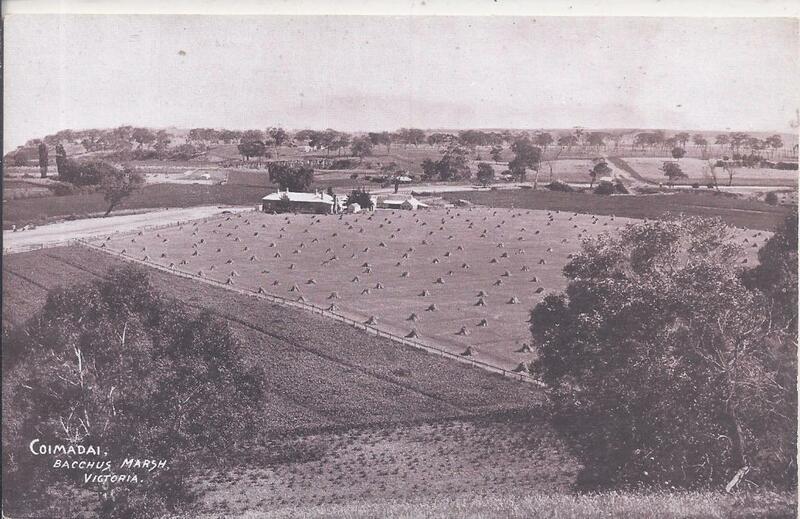 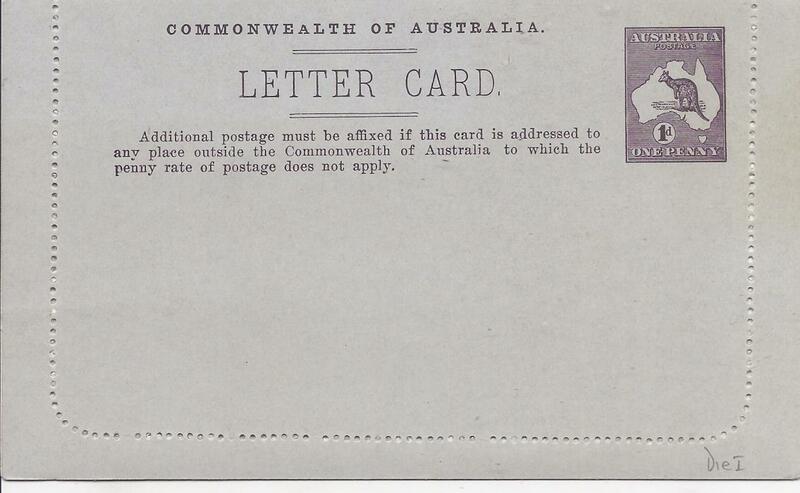 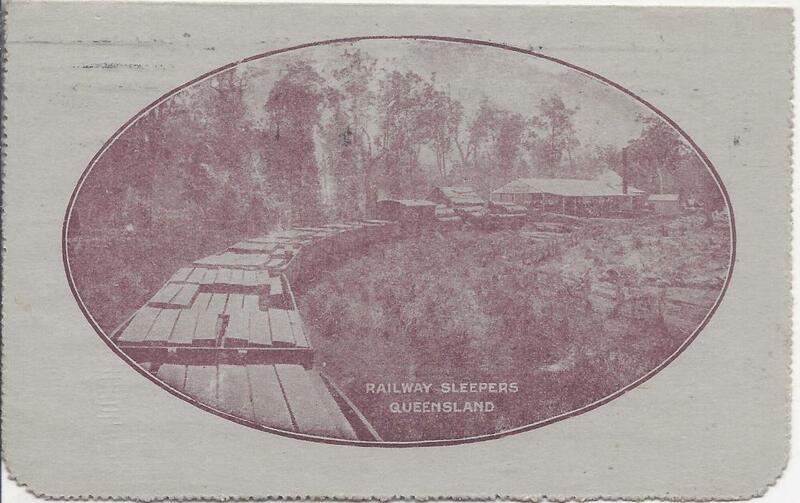 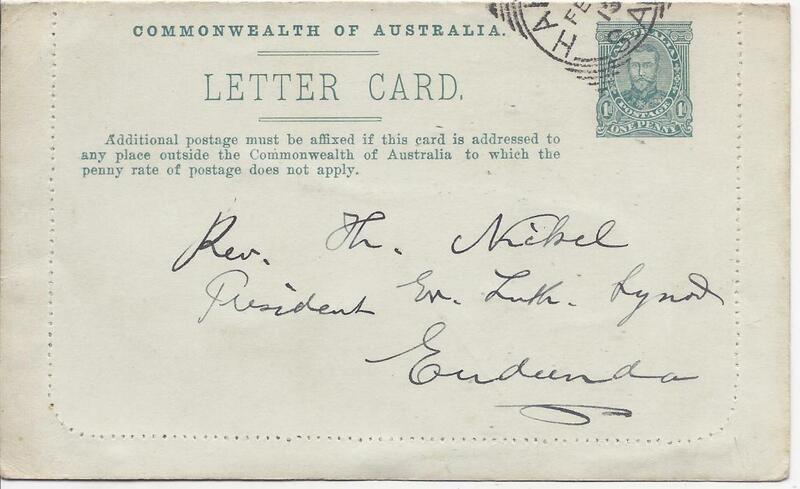 brown letter card, 'The Two Brothers/ Queensland', no stop after Australia, cto with Melbourne cds for U.P.U. 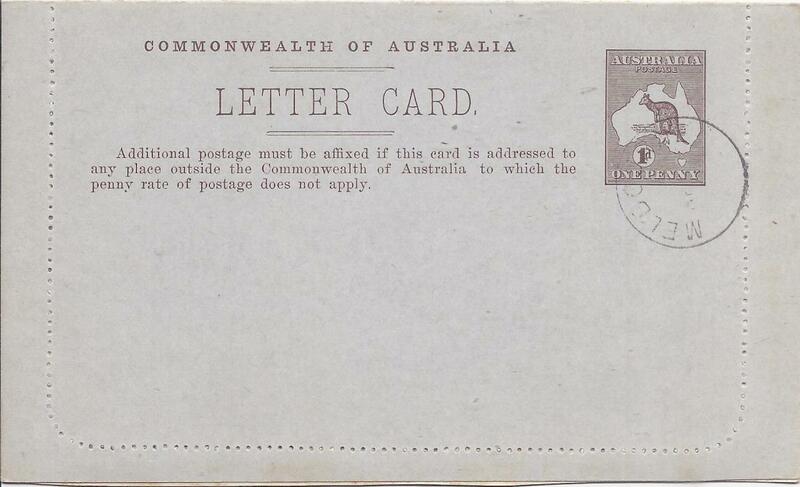 distribution;fine condition. 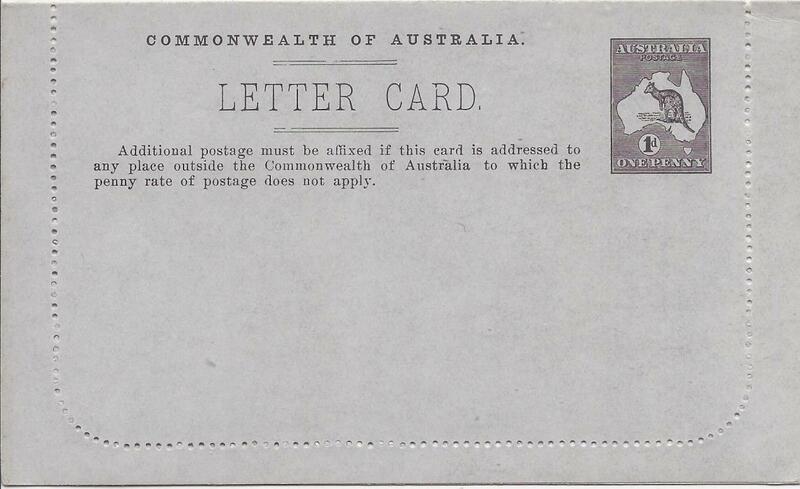 (Picture Stationery) 1913 Original Die 1d. 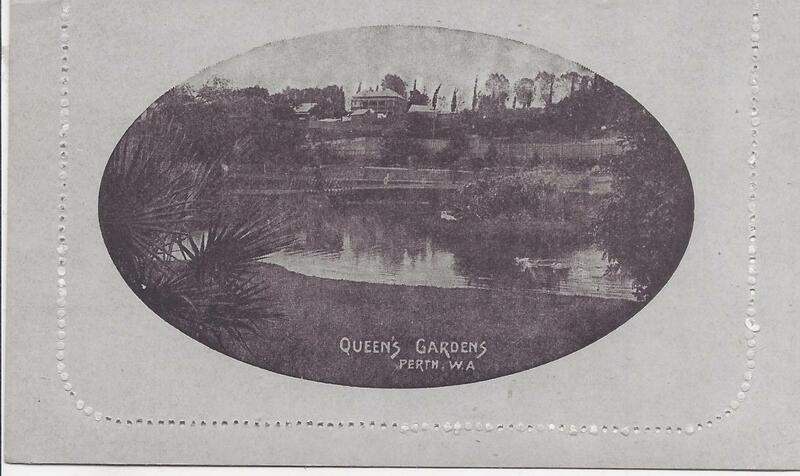 purple-brown letter card, 'St George's Terrace, Perth' showing no sky retouch, small discolouration spot on image. 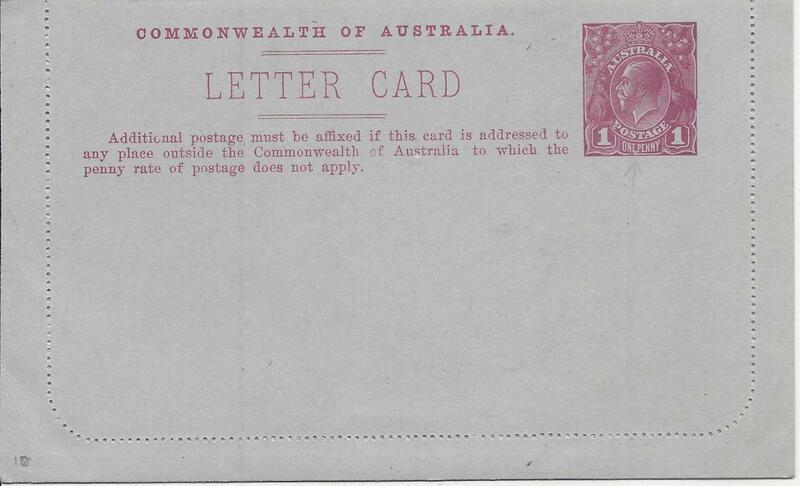 (Picture Stationery) 1913-14 1d purple-brown Roo, original die letter card �St George�s Terrace, Perth� unframed oval without sky; fine unused. 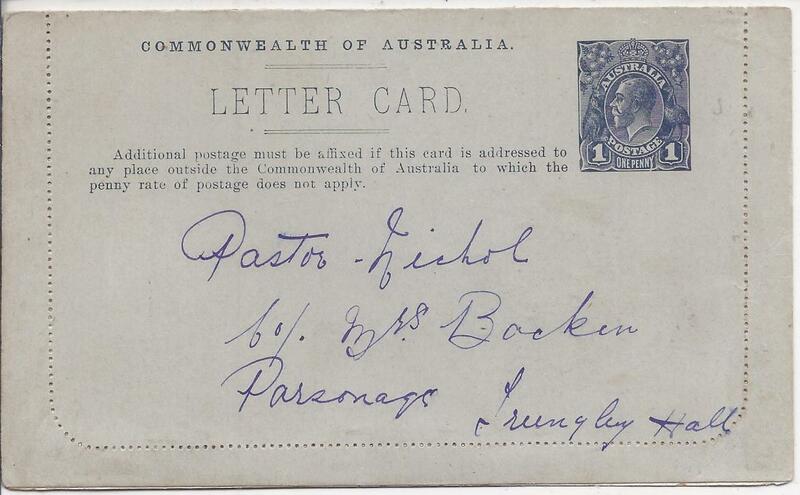 (Picture Stationery) 1913-14 1d. 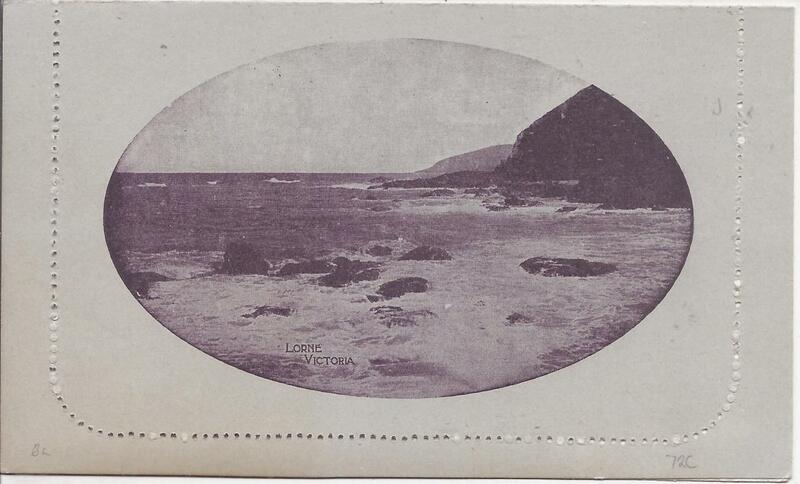 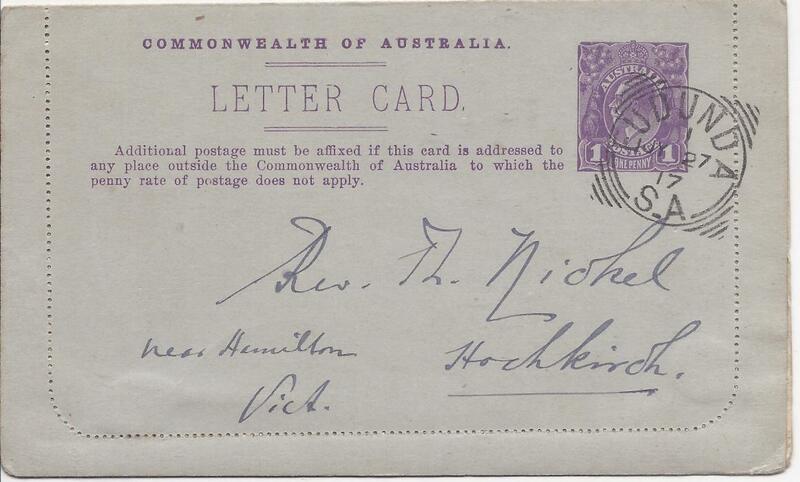 purple-brown Roo, Die I letter card, 'Lorne Victoria', fine unused. 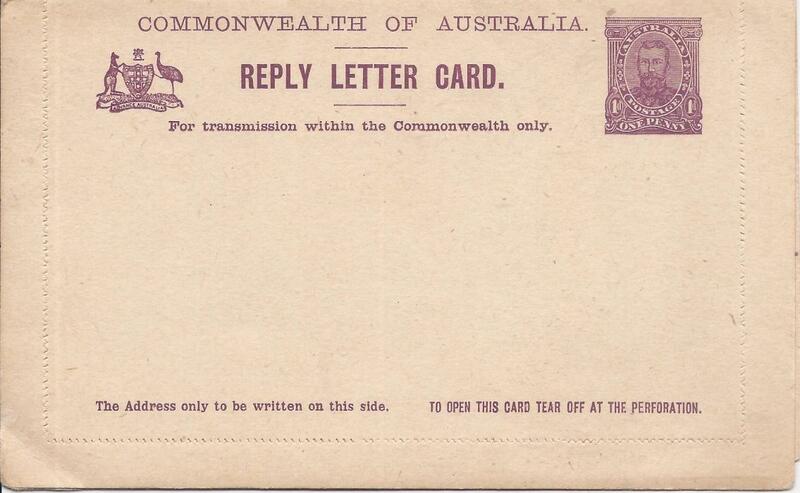 (Picture Stationery) 1914-18 Die I 1d. 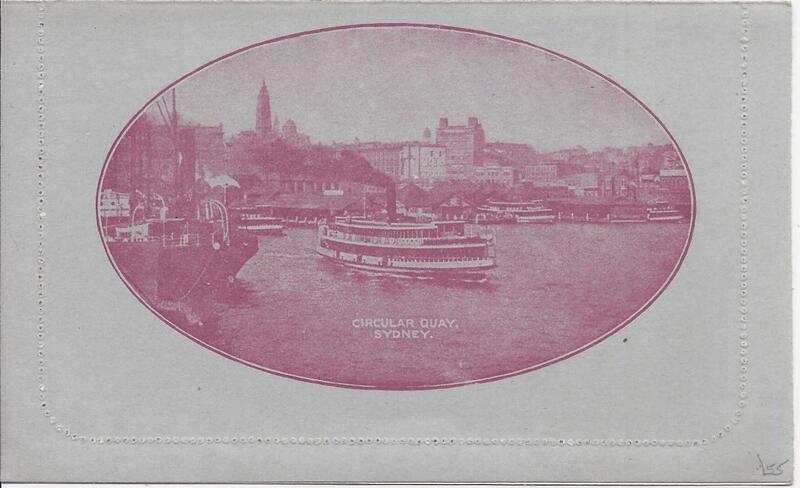 magenta letter card, �Circular Quay/ Sydney� with sky, fine unused. 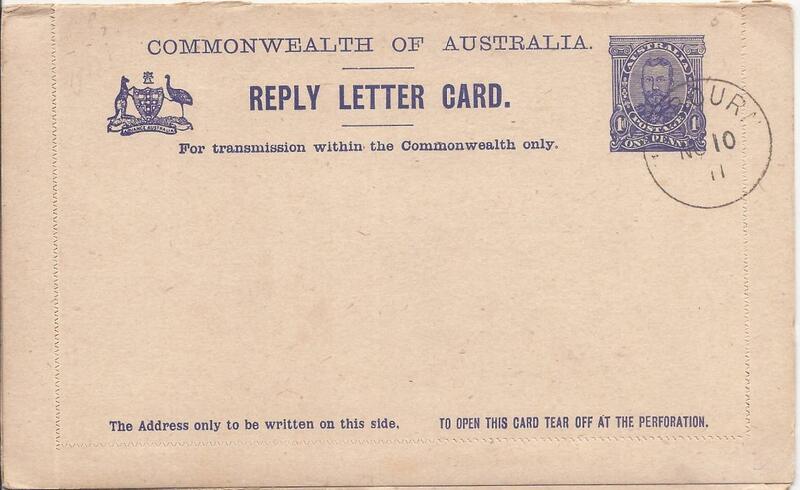 (Picture Stationery) 1914-18 Die I 1d. 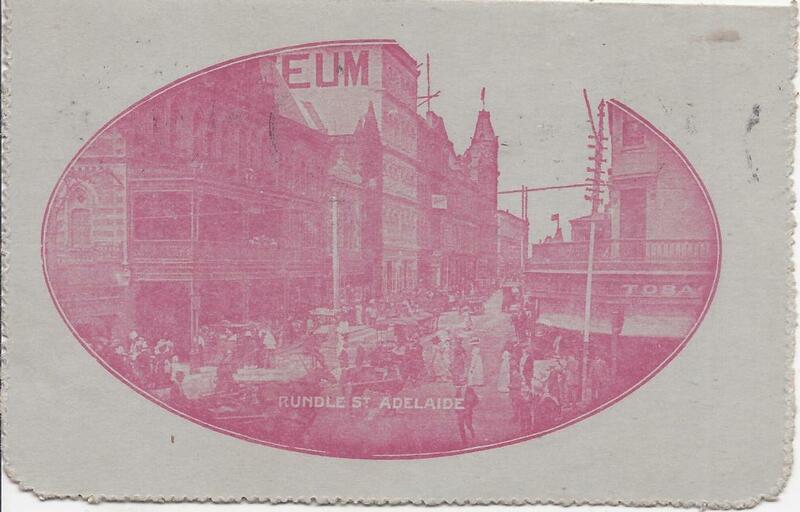 red letter card, �Rundle St, Adelaide�, no sky retouch, uprated used with damaged stamp, short message. 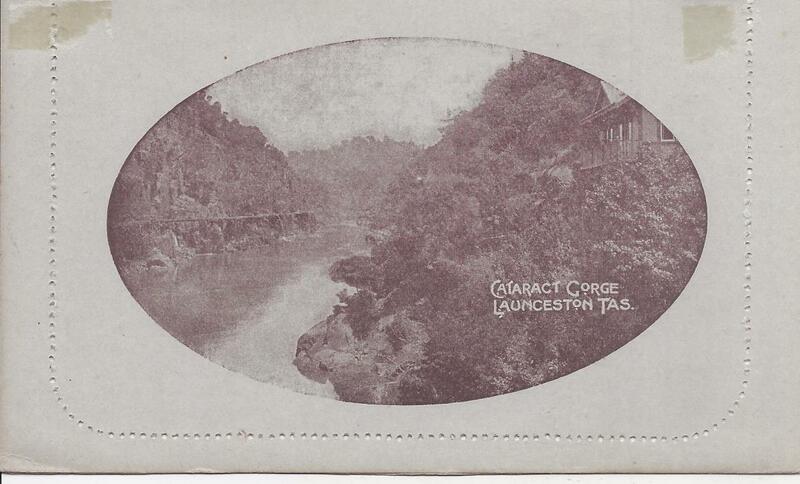 (Picture Stationery) 1917 1d. 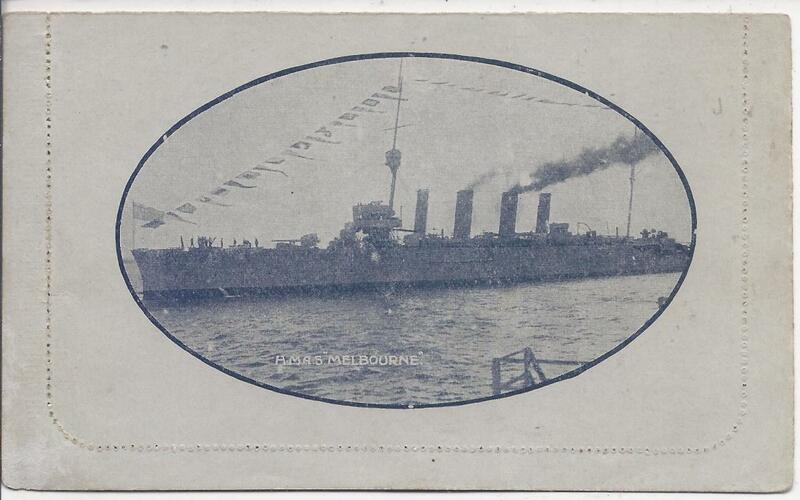 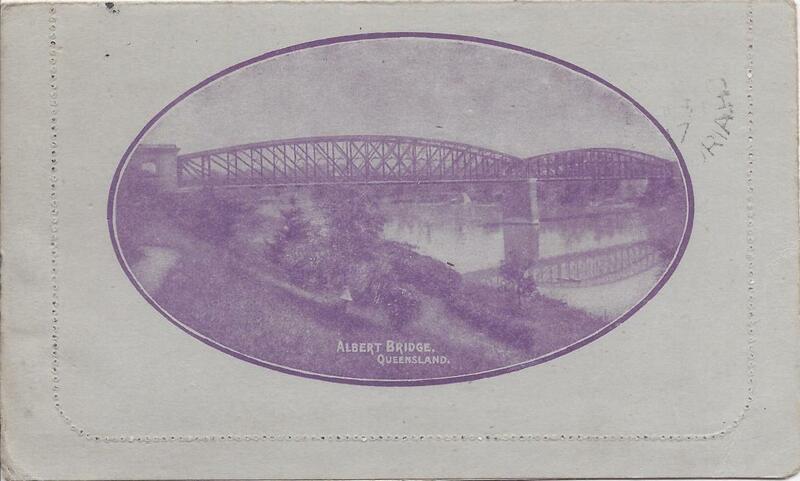 purple �sideface�, Die I letter card, �Albert Bridge Queensland�, used from Eudunda S.A.
(Picture Stationery) 1918 1d. 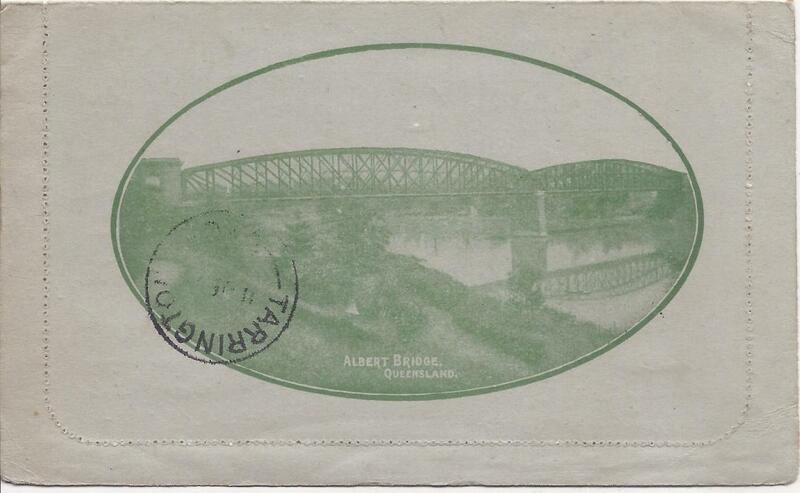 grey-green �sideface�, Die I letter card, �Albert Bridge Queensland�, used from Eudunda S.A.